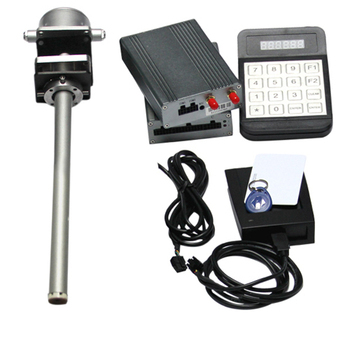 Capacitive fuel level sensor fuel level meter for oil tanks fuel level monitoring solution. fuel level meter, fuel sensor, capacitance fuel sensor, fuel measuring meter, liquid level sensor, fuel meter. JT606X capacitive fuel level sensor is independently developed by JOINTECH, a number of innovative patented technologies enable it can continously detect liquid level with a high resolution(<1mm), as well as adjust the length size to fit different fuel tanks on the spot. It is widely applied to remote fuel cosumption monitoring management of logistic fleet, Generator sets, buses, coaches, construction machines, etc. 1. Resolution: <1mm, accuracy: <0.5%. 2. Cut off size. Fuel sensor can be cut off according to fuel tanks size on site, avoid tolerance caused by wrong size. 3. Simple installation. Patented design simple mounting flange, install the sensor does not need another dozen of screw holes. 4. Wide voltage input, hight and circuit protection. 4-70V wide voltage range input, make sure that the sensor is not under influence of voltage. Muti circuit protection design, reverse connection protection, short circuit protection. 5. Muti signal output support. Voltage output 0-5V, current output 4-20mA, resistance output (0-500Ω). Digital signal output: RS232, RS485, Analog signal output, etc. It can work with GPS tracker device for remote oil tanks fuel level monitoring, and fuel anti theft solution. It is widely applied such as: static tanks fuel level monitoring, truck fleet consumption tanks, base station generator, etc. Shipment: by airfight,express DHL, UPS, Fedex.